It's that time of year when thoughts turn to pumpkins, apple cider, falling leaves and Christmas carols. Wait...whaaaat? Christmas is two whole months away!!! Consider this your official heads up. 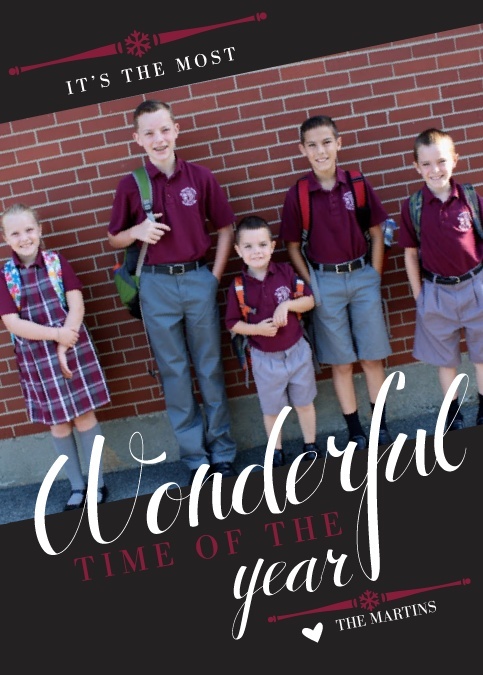 Christmas is indeed two months away, but the time to start thinking about sending out Christmas cards is coming very soon. By the time you coordinate the outfits, pose the photo, choose the card, get it delivered and then mail it out, you're looking at not.that.much.time.left. Have no fear, Colleen is here! I've partnered with Basic Invite to gift one lucky winner 50 free Christmas cards. I've always used a photo website that rhymes with Flutterby in the past for my Christmas card needs, and never thought of branching out until I saw what Basic Invite had to offer. They have unlimited color options with instant previews online. Once you select a design you can change the color of every single element on the card to over 180 different color options so you can make sure the card is exactly how you want it down to the littlest detail!! So you can change the background color, lettering, images, etc. to make it exactly how you want it. You just can't do that on most other sites! It makes it extremely easy to find a card that coordinates with your photo(s) instead of trying to fit your photo to a card. You can even order a printed sample of your actual card so you can see exactly how it will print as well as the paper quality before they ever have to place an order. Basic Invite is just as colorful with their envelopes as their invitations. You can choose from over 40 different colors and all of the envelopes are peel and seal so the envelopes can be quickly and securely closed without licking a single one. They are so winning at this Christmas card game! Not to mention thank you notes, baby announcements and more. Now to delight your ears...and get you in the Christmas spirit while you're designing those cards! I went online and previewed some of the songs and they are beautiful and make me excited for the real reason for the Christmas season. Matthew Kelly says “O Emmanuel is exceptional. 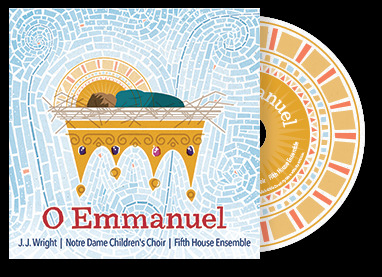 Every Catholic should get the chance to experience this one-of-a-kind Christmas CD.” And Jen Fulwiler said, "The Dynamic Catholic O Emmanuel Christmas album is a must-have for every home. Play it in the background as you go through your Christmas preparations, and you will never forget what this season is really about. It's the perfect antidote to all the distractions that threaten to consume us during this season." There will be ELEVEN winners - one winner of the Christmas cards, and ten winners of one CD each!! Good luck, and remember, you can't win if you don't play! UPDATED!!! Winners are listed below...first winner gets the cards and the next ten winners get the CD! I will email all of you with the details. Congrats!! 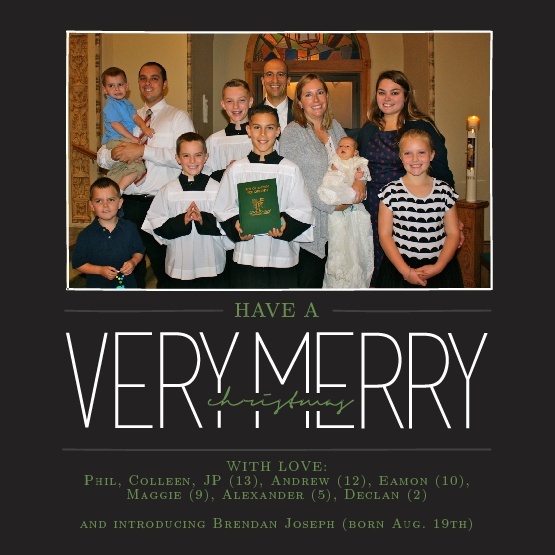 Our favorite Christmas tradition has been coming together on Christmas Eve for mass. That's a great idea for St. Nick!!! We have a traveling Nativity set, so Mary and Joseph *finally* arrive at the stable on Christmas. My favorite Christmas tradition is the big family dinner!!! YUM!!! My favorite Christmas tradition is having my little girls help me bake Jesus a birthday cake and singing Happy Birthday to him. Opening a gift on Christmas Eve. It was always new pajamas and a Christmas movie. Ive since passed this on to my daughter and son! I love opening stockings together after mass on Christmas morning. Ack. You just reminded me that I'm trying to do all my Christmas shopping in November. Which is... next week. Yikes. Love the giveaways! Looking at the Christnas lights. Decorating the tree on Gaudete Sunday. Favorite tradition is Christmas Eve party surrounded by friends and family! My favorite Christmas tradition is going as a family to the Christmas tree farm and cutting down the tree! My favorite is all of the Advent saint feasts! Midnight Mass has become the most favorite tradition for the littlest to the biggest. We haven't established many traditions yet since the kids are all so little but my fave so far would have to be letting the kids help decorate the tree with Christmas music playing. I love using my Gram's recipe for molasses sugar cookies and gingerbread men and bringing them to our family gathering. watching Home Alone with my 6 siblings and parents and drinking wine until midnight, when the karaoke starts. hiding the pickle in the Christmas tree is my favorite tradition. Santa visits the big family party during advent.